The time has finally come: after a successful first Downhill training run, the 76th Hahnenkamm Races can be officially opened this evening at 18.30 hrs in the Legends Park by K.S.C. President Michael Huber. The unveiling of the World Cup commemorative monument „Stein des Anstoßes" is another item on this evening’s programme. This special stone symbolizes the fact that ski history was made in Kitzbühel on the 20th January 1966 – namely, the idea of the World Cup was born at the Seidlalm, which set Kitzbühel‘s „World Cup" success story in motion 50 years ago. 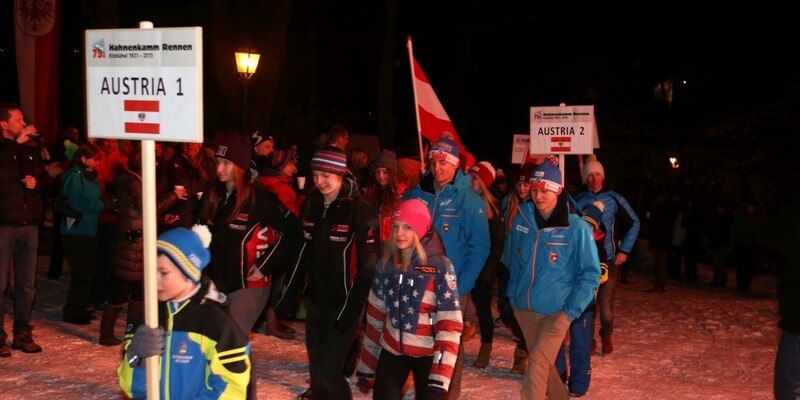 Participants of the Hahnenkamm Juniors will also be presented to the public during an official marching-in ceremony by all team nations. Traditional discussions with contemporary witnesses will then take place at 19:30 hrs in Kitzbühel Museum. As part of the anniversary celebrations, participants will tell their stories of the history of the World Cup. Contributors include ski legends such as Hansi Hinterseer, Stephan Eberharter, Olga Pall, Heini Messner, Hanni Wenzel-Weirather as well as ski historian and K.S.C. President, Michael Huber.